Look, we’re all tired of waiting for the new Tool album, so here’s a new tidbit of info to pore over: Justin Chancellor has jumped ship from Wal after two decades, and landed himself a Warwick Custom Shop Masterbuilt Streamer Stage II Bass. The model boasts a bubinga pommelé body with natural oil finish, while its ‘hidden neck’ construction features wenge paired with afzelia stripes. Tigerstripe ebony is used for the fingerboard, while illuminated fingerboard side dots aid playing on dark stages. 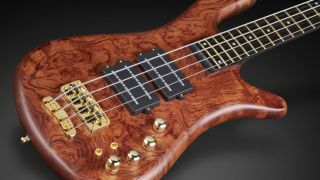 Most exciting is the appearance of two custom-built Nordstrand MM Style pickups, adjusted via individual pickup volumes, balance, mid, treble and bass controls. 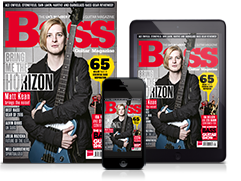 Could this bass radically alter the direction of prog-metal’s most elusive band? Only time will tell, but for now, you can take a closer look at Chancellor’s new toy over at Warwick.